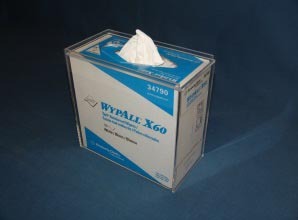 The Wypall, heavy-duty, clear acrylic dispenser provides extra support for the popular Wypall X60 wipes. They may be mounted to the wall, bench or carts. The boxes of Wypalls easily slide into the dispenser.